Journalist, author, and antiquarian librarian, Cuyler Reynolds also was an important historian of the city of Albany. He was born in Albany on August 14, 1866. He was the son of Dexter Reynolds and his wife, Catherine Cuyler Maley Reynolds. He was the older brother of Architect Marcus T. Reynolds. Educated at the Albany Academy and at a boarding school in Catskill, he emerged as a journalist and writer. He was the first curator of the Albany Institute of History and Art. 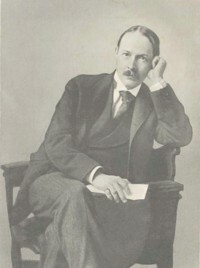 He became Director in 1899 and served for ten years. He also held the title of "Albany City Historian!" His chief work on Albany history is Albany Chronicles. He also published a number of very substantial genealogical resources. He died in 1934 and was buried in the Albany Rural Cemetery. Although not part of the "People of Colonial Albany" study population, Cuyler Reynolds was one of Albany's major historians. This profile is derived chiefly from a sketch printed in Hudson-Mohawk Genealogical and Family Memoirs. The engraved portrait of Reynolds shown above is from the frontispiece. See also, 200 Years of Collecting, pp. 28-34. A photographic portrait of him appears on page 29.